The next literary installment of Prof. Robert Langdon’s adventures hit SA bookshelves last week, and without missing a well printed sales slip, I bought it and immediately started my exciting journey. So before I continue, I must state that I am 100 pages from the end, and I write this entry without knowing the end (well, except that I am 100% sure that Prof. Langdon will succeed). While I will try not to give too much away, at least I won’t give the ending away, simply because I don’t know it yet. As with all the other works in the series, Don Brown has masterfully infused the world of history, art and fact with a wonderfully imagined adventure thriller. 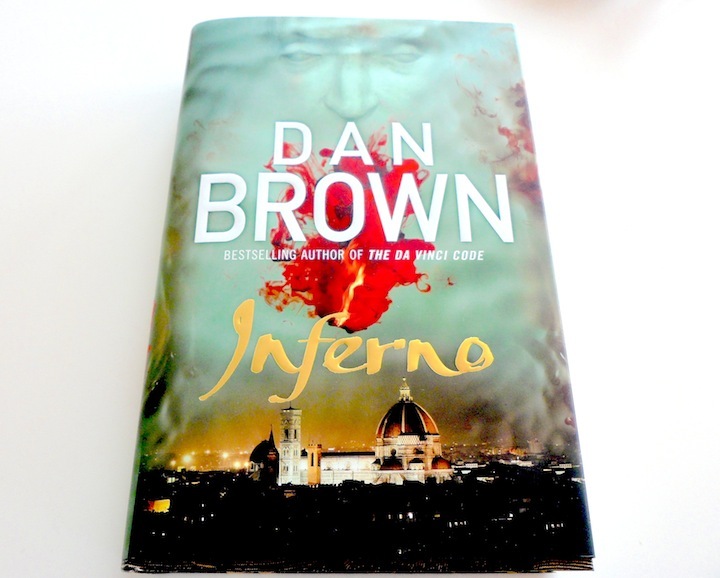 But, perhaps, of the series, this book has a factual grounding that is bound to come true – one way or another, and this prophetic reality is what makes Inferno far more thrilling, and gets you thinking about the world in a way that is unsettling. Consider that in the last hundred years, the world’s population has dramatically increased, so much so that the consequences of this are most evident in rising concerns of water and food availability, extreme economic instability, and the birth of new, terrible diseases. And as these take hold, that which we hold dear as the pillars of humanity slip away, and the animals in us come out. Naturally, this will not go by without a radical solution being proposed. The problem = too many people. The answer? What terrors will soon follow from this extreme population explosion. Inferno is set against the backdrop of one of my most favourite cities, Florence – without doubt the cultural heart of Europe, the birthplace of the Renaissance, and home to the majority of the world’s art treasures. To be able to vividly create images of Florence, it is clear that Dan Brown had to live in Florence for a considerable period. His detailed accounts of the walkways, gardens, streets, artworks and churches transport the reader directly into Florence, while, my personal journey into Dan Brown’s world was made far easier having experienced the city first hand. 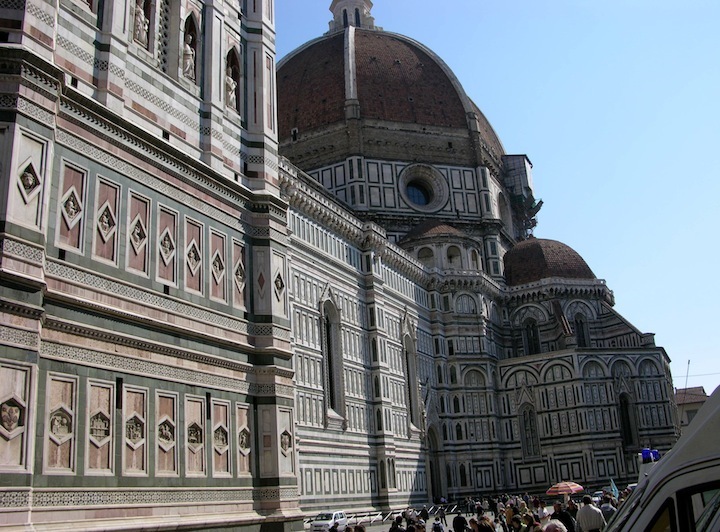 il Duomo – the heart of Florence and where Prof. Langdon discovers a series of clues. Into this story, Dante’s Divine Comedy (no, this is not a comedy – way back when ‘comedy’ simply meant that it was written for the masses), specifically Book 1 Dante’s Inferno, is interwoven throughout the novel, but don’t worry, you don’t need to have read it as Prof. Langdon explains it over and over again. In a nutshell, Dante’s Inferno explains Dante’s decent into the deepest depths of Hell, before going through purgatory and emerging in paradise. The artist Botticelli beautifully, or perhaps deeply disturbingly, painted the various levels of hell. 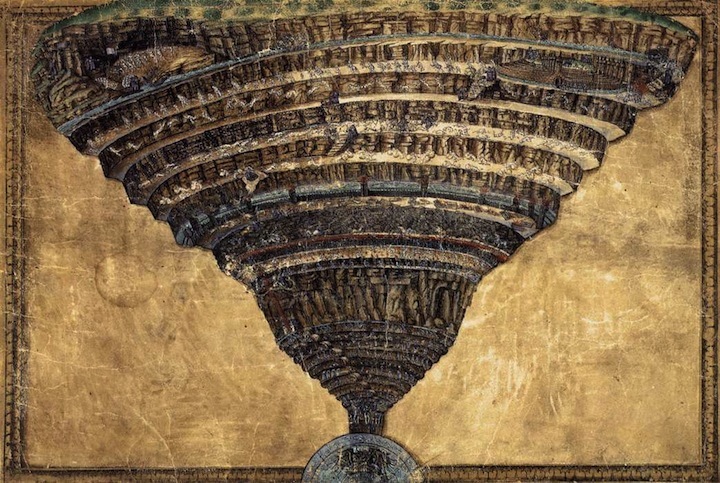 The 9 Circle’s of Hell was imagined by Dante and painted by Botticelli. Once Langdon discovers that they are in a race against time to stop a madman from unleashing a virus aimed at culling more than 1/2 the world’s population, the story gets exciting, and Brown leads you done a path where your mind jumps to make connections, and thankfully, you tend to be wrong, making the book even more exciting. Prof. Langdon’s trail to find the clues leads him beyond Florence and into Venice, culminating in a ride in a boat (made of South African wood) to St. Marco’s Cathedral, where he makes reference to the interior of St. Marco’s Cathedral being lined with gold – a fact that I am glad I have a picture to prove it. The inside of St. Marco’s Cathedral, lined with Gold. Inferno is the equivalent of an action, adventure movie – and written in, well, more of a movie screenplay. The chapters are extremely short, and read more like movie scenes, and while I would usually feel robbed with chapters that are no more that 2 pages long, the content is extremely engaging and entertainment. Its a whirlwind of a read; educational, enjoyable, exhilarating and fun – so much so, that you will definitely want to skip your usual television shows in favour of a fast-paced novel, excellently crafted, researched and written. And to top it off, it will also get you thinking about the crisis that faces our generation – over-population and the terrible consequences thereof. Its a sobering topic. But, once you regain your sense of denial, the book is extremely fun and addictive. Money well spent. Frozen Yoghurt never tasted so good! The Dictator – The Ultimate Coffee!